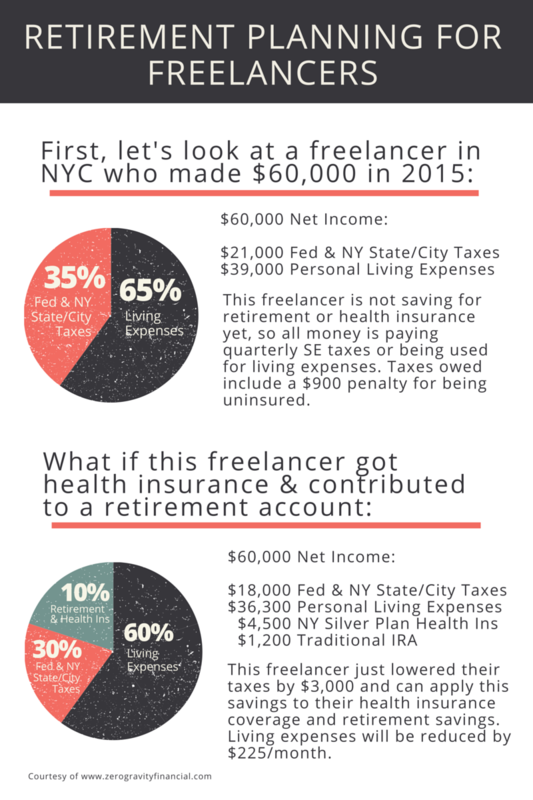 Is it possible for a freelancer making $60,000 in New York City to save for retirement and have health insurance coverage? The biggest difference between W-2 employees and freelancers is that freelancers don’t have existing HR benefits and therefore do not enroll in health insurance or retirement plans. While W-2 workers have access to established employee benefits and group insurance plans, freelancers do everything themselves: sales, marketing, operations, techonology and bookkeeping. For a freelancer, there is no time leftover to setup retirement accounts, research and signup for insurance, and enroll in other tax advantaged benefits. In the first example, the freelancer did not contribute to a retirement plan or have health insurance coverage. They ended up paying $21,000 in Federal, New York State and City Income Taxes, including a $900 penalty for being uninsured. 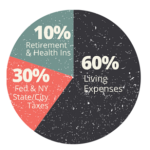 In the second example, the freelancer gets NY Silver Plan health insurance coverage for the entire year, and contributes $1,200 to a Traditional IRA. As a result, they paid $3,000 less in taxes, going from owing $21,000 to $18,000. Saving for retirement and having health insurance coverage would normally cost $475/mo. However, because these benefits provide a tax deduction, it lowered the cost to $225/month. Review your budget. What monthly expenses can be reduced or removed by $225, how can you increase your income, or a combination of the two to make up the difference? Review health insurance plans and sign up for coverage. Open a Traditional IRA account, and setup monthly transfers of $100 to your new account.